I posted a little about the team Halloween party we had on Sunday and got a few questions I wanted to address...the desserts were made by Little Leahs Kitchen and were AMAZING, I was actually just requesting more brownies from her, haha. The photo booth was Frenzy Booth and they were awesome, would highly recommend. Lastly, here is the link to the Tarot Card Reader we used. She was a lot of fun! I don't take that stuff seriously but think it was a really fun addition to our party. She made some predictions about the birth of the baby so if those things end up being true I might be whistling a different tune, haha. 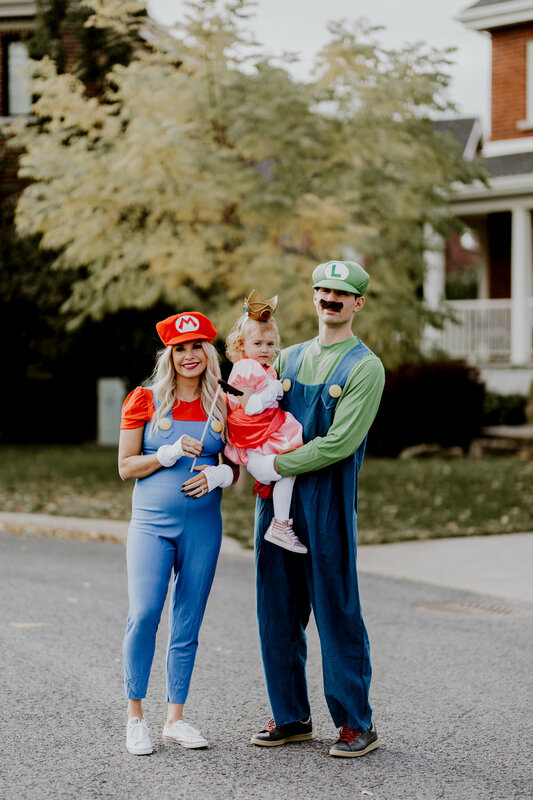 For today's post, I am just sharing some of our family Halloween pictures. 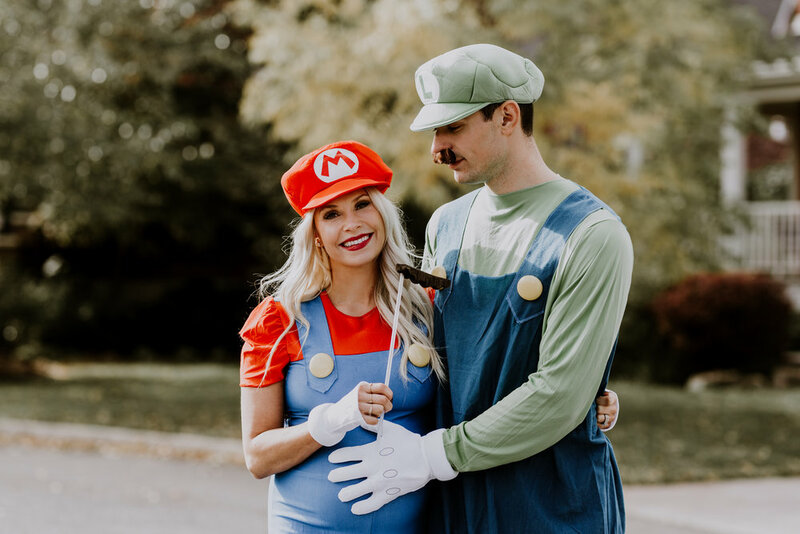 We usually do a family trick or treating costume and then a separate costume for the team party but because I was so sick for a lot of the month we just went with the one costume...so thank goodness we did these family photos before the team party because Carey and I's costumes are not looking too pretty. I don't know how you could be covered in red wine when you didn't have a single drink all night, haha. So not sure what we will do about it tonight, maybe just sport our hats or something. We got our costume's from Halloweencostumes.ca this year, first time using the site and it was great. I ordered the costumes in September so it was nice to get the shopping out of the way so early. Sizing was a bit tricky for Liv and for me due to the belly! For those asking I am wearing a Large, which was not the greatest fit for length and stuff (which you can see) but worked well for around the belly. 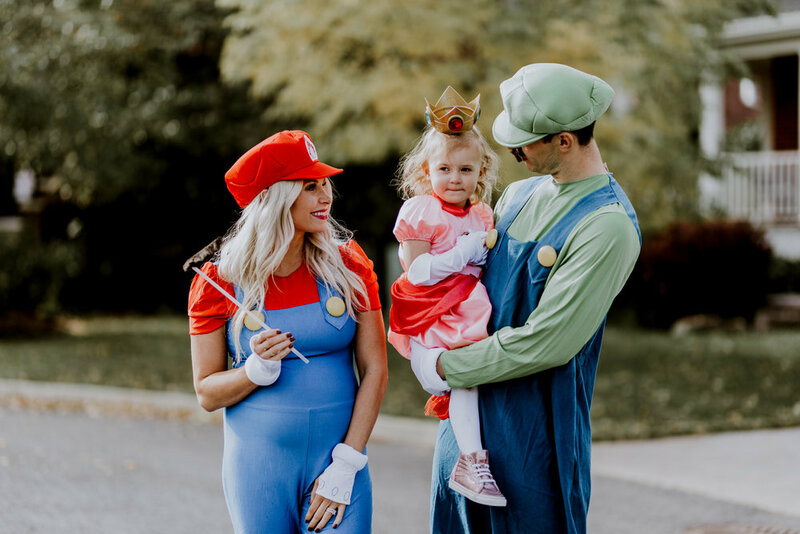 ** I just got on the Halloween costume site and their costumes are already on sale so might be a good time to get ahead of the game and order next years!